James B. Conant (1893-1978) was one of the titans of mid-20th-century American history, attaining prominence and power in multiple fields. Usually remembered as an educational leader, he was president of Harvard University for two tumultuous decades, from the Depression to World War II to the Cold War and McCarthyism. To take that job he gave up a scientific career as one of the country’s top chemists, and he left it twenty years later to become Eisenhower’s top diplomat in postwar Germany. 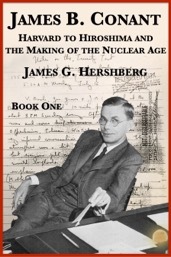 Hershberg’s prize-winning study, however, examines a critical aspect of Conant’s life that was long obscured by government secrecy: his pivotal role in the birth of the nuclear age. During World War II, as an advisor to Roosevelt and then Truman (on the elite “Interim Committee” that considered how to employ the bomb against Japan), Conant was intimately involved in the decisions to build and use the atomic bomb. 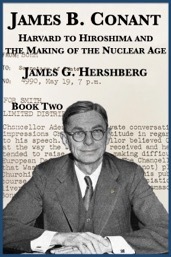 During and after the Manhattan Project, he also led efforts to prevent a postwar nuclear arms race between the United States and the Soviet Union that, he feared, threatened the survival of civilization — an apocalyptic prospect he glimpsed in the first instant of the new age, when he witnessed the first test of the new weapon at Alamogordo on July 16, 1945.